This confused “Early then cold then a bit late” season has done nothing to deter this plant. 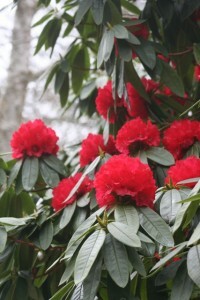 R.arboreum ‘ Blood Red’ has to be seen to be believed. Striking “Blood Red” flowers completely cover the shrub/small tree. Ours was hidden behind a cherry laurel hedge for years but now that has been removed she can shout “look at me” at the top of her voice. Walking from the Camelliarium to the west terrace you will be stopped in your tracks with her beauty. R.arboreum was the first Rhododendron introduced from the Himalaya and now is a true star plant in many of the Great gardens of Cornwall.